Over the past year and a few months, we, my coworkers and I that is, have been using an Actor Model framework to implement a sort-of state-engine-based distributing computing engine. Using a generalized framework for this seemed to introduce many complexities that, in my mind, could potentially be simplified. 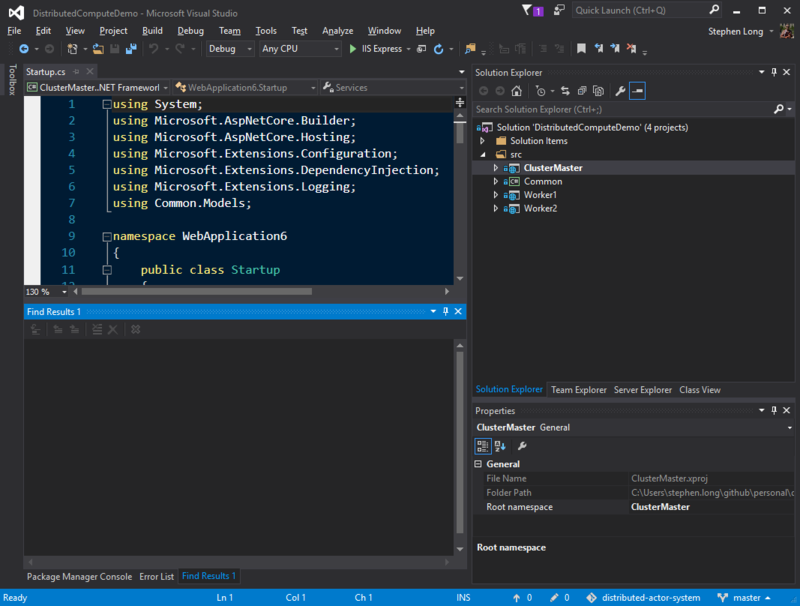 My weekend project is centered around exploring what can be done out-of-the-box with .NET Core. The Actor model adopts the philosophy that everything is an actor. This is similar to the everything is an object philosophy used by some object-oriented programming languages. I break away from this a bit in that I don’t consider everything an Actor. One of features touted by the latest .NET Core is a lighter pipeline that can send and receive messages at a faster rate. That is to say, scale-ability has been improved and .NET Core is decoupled from IIS. With the decoupling comes the ability to self-host with the Kestrel server as a Windows service or as a web site. Effectively, this means we can create our services just as we would a web site and use .NET Core’s MVC framework for our API communications between the cluster and nodes. I like using the built-in features of .NET, personally, for communications. Jumping right in, I created (3) ASP.NET Core Websites and a class library within a Visual Studio solution. 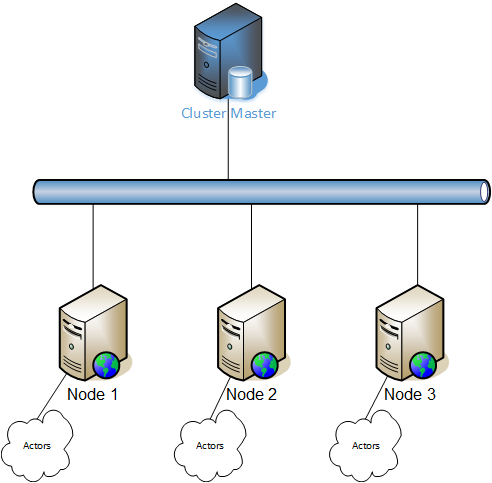 The ClusterMaster is, well, my cluster and the two worker projects are my nodes. I wanted to keep everything reusable, so nearly all of the “meat” of the solution is the Common library. I have .NET Controllers, helpers, Actor code, and all messages/services/etc in this project. Hooking that code into a Web Site (Service) application, becomes very easy. Part of this side-project was born out of another services-related project I was working in which I wanted to track service status. I wrote a little status tracker with callbacks (Action<T>) type stuff where T defined the status message that is sent back and forth. It become the ground-work, or idea, for tracking state. You’ll see later on that IWorkerStatus is injected as a singleton into each node and the cluster. Additionally, the WorkerStatus provides the WorkerNodes with the capability of defining their actors and passing messages to them in a round-robin queuing manner. The WorkerStatus implementation provides options to add Actors, remove Actors, and add callbacks for status updates. I sometimes use these callbacks to trigger workflow steps and such. For the Actor, I have implemented an interface, an abstract class, and base concrete implementation of the abstract class. Each actor must, at a minimum implement the basics – like being able to be told what to do, provide a cancellation token since they need to be async (multi threaded), and such. They also need to provide a “Callback” to allow telling their node that they are done with a task. Here’s the abstract class for the BaseActor. T is the status message type. We have a status message queue, an IsBusy indicator which uses locks to make it thread safe, and some other plumbing. The _actions, _queue, RemoveCallback, and AddStatus are all provided for dealing with status messages. I’ll eventually make the the actor have a handle to its parent node with the node being an actor itself. Then, I can eliminate some of the T message type references and simply Tell the node the actors status. For now though, there is the explicit callback for status updates. That was the intent, though it changed a little bit. As I mentioned, the _actions dictionary was intended to provide actions to invoke when status messages are bubbled up from the actor. However, I found that I wasn’t using it through my test project and created a separate Callback so that only messages that explicitly sent to this Callback invoke an action. That action is intended to be the “actor is done” call to allow enqueuing/dequeuing of requests to proceed. The node will also relay this completion, eventually, to the cluster for state tracking. The Receive “action adder” method is interesting. With this method in the abstract class, we can define our type message handlers. These handlers are then stored in our ConcurrentDictionary and keyed by message type. Having to convert the actions to Action<object> was an interesting little problem to figure out. // We have to wrap the action order for it to be Action<object>! The Tell method is the point of entry where we can communicate with the Actor. We can tell the actor anything by passing in a strongly typed message. The actor will enqueue the message and then process it when it gets around to it. The actors process messages one at a time from the queue. The ProcessMessage implementation dequeues the messages, sets the busy status, and checks to see is there is a specific action that is defined to handle the message. If the Action is found, then a Task is spawned to run to invoke the action. Last, but not least, for the Actor, I have defined my own implementation of the abstract class that actually does some work. You’ll notice the actor can receive a StartJob message or a ProcessMarket message. The actual jobs only print to the console window, but it was enough to see things working. You’ll also notice that the Callback method is called after updating the status. This will let the node know, if it has attached a callback handler, that the Actor has completed the requested Task. I should also mention that all Tasks have an identifier for tracking purposes. Let’s take a look at the WorkerNode piece. The worker node is a stand alone class that houses the actors and provides all communicator to/from the cluster. Within the constructor, the list of BasicActors is populated and callbacks are added. When the service/website starts up, the WorkerNode defines a TaskRepeater that continually attempts to join the cluster. It tries every 30 seconds. This may seem like overkill, but I kept it like this so that this can be seen as a heartbeat. The cluster could, for example, use a timestamp to know when the last communication occurred with the WorkerNode based on this heartbeat join request. Conversely, if the WorkerNode is stopped, we can hook in the Service/WebSite lifecycle to let the cluster know we are no longer available. // Tell "cluster" I'm gone!. If you didn’t see it above, the WorkerNode defines a callback for all messages bubbled up on the IWorkerStatus. If the WorkerStatusMessage has a PayLoad, the WorkerNode “Tells” that PayLoad (typed message) to the Next Actor in the round-robin queue. Let’s take a look at the cluster piece. The cluster is pretty simple. Note that it inherits from my BasicActor because I wanted to be able to have it receive strongly typed messages, for when jobs complete and such, and having that code-reuse was helpful. Here is the basic cluster and its constructor. Within the constructor, the cluster uses the BasicActor’s implementation of defining handlers as Action<T> that are executed based the type of message (T) received. This helps keeps things generic with a huge amount of cruft. // Why wasn't it found? The NextNode of the cluster provides simple round-robin access to the nodes that have joined the cluster. When the service/website starts, we have a simple random task repeater sending messages to the nodes. This is illustrative test code. The TaskRepeater helper is in the Common.Utilities. Note that this bit of code uses the NextNode method to perform round-robin requests to the nodes and randomly sends one of two messages to the nodes. // Randomly choose what to send to the waiting nodes. We can utilize this WebHostService to self-host as a Windows Service. In our Main method, we can conditionally run as a service. Once the Program.cs has been modified, and we have compiled the source, we can install the *.exe’s as services with “sc.” Why bother? Well, we have effectively implementing everything as WebSites which means that, in addition to being installed as services, our services will have the full .NET Core Kestrel pipeline available. This opens up opportunities to see statuses of the Cluster, WorkerNodes, or Actors in real-time with very little additional tooling. We could just pop-in some Angular views and controllers and additional API endpoints to grab statuses for a nice graphic of the health of our distributed computing system. To use it, download load it, build the solution, and hit F5 to start the Cluster. I generally right-click the Workers in solution explorer and use “Start New Instance” to launch them one at a time. You can put in break points to see the the WorkerNodes connecting to the Cluster, the WorkerNodes receiving Task requests, and the Actors running/completing the Tasks. I have not built any sort of UI around this project at this time. You could also, theoretically, add as many WorkerNode projects as you want, point them to the Cluster, and it would all work in an orchestrated fashion.